The month after Apple released the iPad, I started iPad Academy as a simple blog hosted on Posterous. I decided from the start that iPad Academy wouldn’t be some rambling personal journal, full of commentary but short on substance. My blog about the iPad would be “about you and content you can use.” In November 2010, I moved iPad Academy to a new host and rebuilt the blog in WordPress, organizing the content to make finding what you want simpler and expanding the ways we could connect and share. Decades of experience as a technology educator led me to focus on teachers and trainers as the primary audience for iPad Academy. A business startup, 172 blog posts, and two iPad book editions later, it’s time for iPad Academy to evolve again. Most of my professional career in higher education was devoted to helping others make sense and make use of technology. (See About The Author – The Portable Prof™) As a “freelance professor” I now enjoy consulting, teaching and working with folks of all ages and organizations of all kinds who want to learn more about using the iPad. For example, this week and next I’m leading two hands-on, introductory sessions for local Learning in Retirement groups. Next month I teach a series of day-long, professional development workshops for higher education faculty/staff and lead a session at an eLearning conference. In March, I’ve been invited to give the keynote for a regional conference for library media specialists as well as lead two mini workshops. I’m also consulting on integrating iPads into the curriculum for a local charter school. Am I telling you these things to brag? No. (OK, maybe a little) That glimpse of my calendar offers clear indications of what I (and others) recognize as my skills and what I truly enjoy doing – helping others learn about and use emerging technology, in this case, the iPad. Not just for teachers and technologists, not just for colleges and universities, but for anyone or any group who wants to make the most of the Apple iPad, apps and accessories. It’s time to harmonize my blog and business, serve that broader audience and give iPad Academy wider appeal. First, I want to thank and reassure my fellow educators who’ve been following iPad Academy. You’ll continue to find plenty of valuable resources for learning about the iPad and for helping others to do the same. Special thanks to my visitors from higher education. I began this blog with you in mind and will continue to offer you and everyone who visits ways to improve your productivity and professional skills with the iPad. Recall that when I started iPad Academy, my goal was to give you content you can use. You’ll notice a new emphasis on learning to use the iPad, apps and accessories. We’ll concentrate on tips, tutorials, reviews and recommendations, on content you can really use. Here are five examples that illustrate what I mean. That last item introduces a new learning method for iPad Academy – the video tutorial. That iPad video tutorial got more positive comments than any other item I’ve posted, so they’ll be more iPad how-to videos in the weeks ahead. You’ll continue to find links to other iPad resources and sites, questions and answers on iPad topics and information to keep you and your iPad up to date. Here are two examples to illustrate what I mean. A free copy is no longer available. However, you can order my eBook using the link in the sidebar on the right. On January 1st of this year, I released the second edition of my (soon-to-be) wildly popular guide to the iPad, iPad Academy: Tips, Tricks and Clever Techniques. This eBook is for sale through my website and other outlets such as Amazon, Barnes and Noble and Apple’s iBookstore. For a limited time, you can get a copy for free. Sign up for your complimentary copy using the opt-in form in the sidebar of the blog. As they say on TV infomercials, “But wait…there’s more!” During the month of February, you’ll also get access to my new monthly newsletter with even more information on the iPad, apps and accessories. So sign up today and you’ll have your free PDF eBook in a matter of minutes. Enjoy the complimentary copy of my eBook and then watch your February email for how to get the first edition of the new iPad Academy newsletter. Thanks for reading this far. 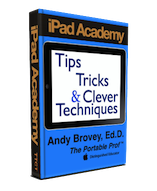 I hope you enjoy my eBook and the improvements to iPad Academy. As always, I’d like to hear what you think. When you can, please take a moment to leave a comment below on the book, the blog improvements or both. Many thanks! I am a teacher and will be attending ISTE conference. I would like to ask if you think I should buy an ipad before the conference or take a workshop that includes the ipad? Also I don’t think I need the 3G because I will not use it on a phone network am I correct in this thinking? Taking a workshop that includes the iPad may mean you’ll need to accept whatever iPad model the organizers have chosen to distribute. You should select your own. I too am attending ISTE and will be offering an ISTE workshop on Monday, 6/27/2011, 4:30pm–7:30pm, called “iPad Academy: Tips and Clever Techniques For Teachers and Techies.” I hope you’ll consider joining me there. Apple and others offer free resources to learn about the iPad. Find out more about these in Chapter 0 of my eBook guide to the iPad called “iPad Academy: Tips, Tricks and Clever Techniques.” For a limited time, you can get a free copy by signing up for one here in the sidebar on the blog. Wi-Fi access is widely available and given what you’ve told me, you have no need for a 3G model. Hope this answered your questions. Let me know when you get your new iPad! Nice post! This is a very well written and informative. I really like your explanation. Thanks for sharing this great information.